The Irresistible Belgian Waffles.. These are a yummy way to include the goodness of fruits into our meal. Did you know that the Belgian Waffle was actually called the "Bel-gem" waffle when it was introduced? 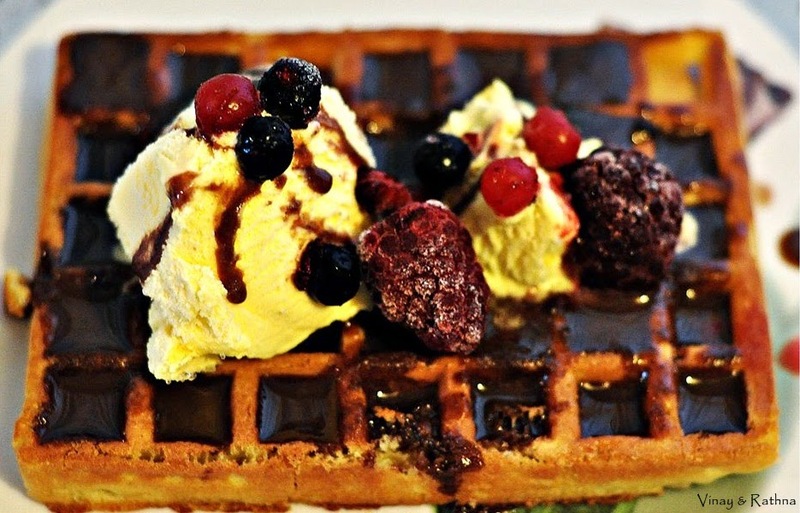 Waffles are also more commonly eaten in the North America than in Belgium! Prep the Nutella sauce by heating Nutella and Milk for 2 mins in the microwave. Place the Waffle and pour half the Nutella sauce over the waffle. Top it with Ice cream and fruits and then pour the rest of the Nutella sauce over it. A shop bought chocolate sauce can be used instead of Nutella. Choose fruits of your choice. We had a mix of summer fruits at home and hence this was our choice. Whipping cream can be used instead of Ice cream. I love Belgian waffles! Although I do think that's a misnomer. Belgians have different variations of their waffle according to each region, and the ones made in North America and the rest of the world is a lot different. Well anyway, I think your take on that popular breakfast treat is really decadent. I can't help my mouth from watering, just by looking at that picture. I'm going to try that out ASAP! Thanks for sharing the recipe.